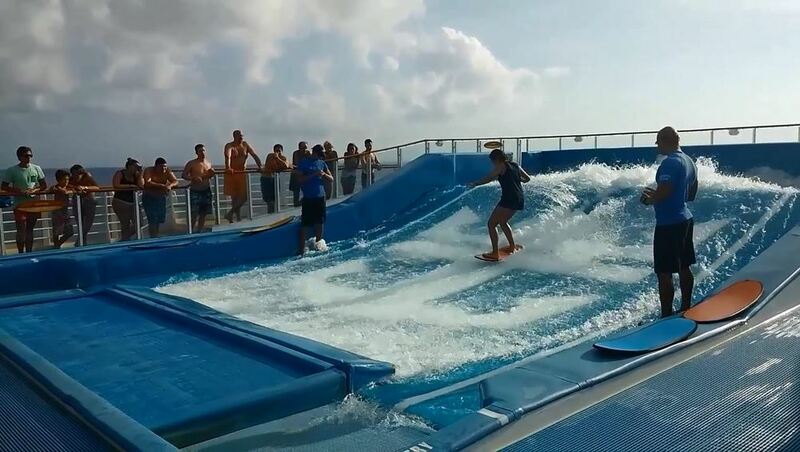 See my earlier article about Oasis of the Seas Cruise, Western Caribbean. That article has a lot of detail with information that is hopefully helpful to everyone for either of these ships. It also has sections that may be of special interest to first-time cruisers. 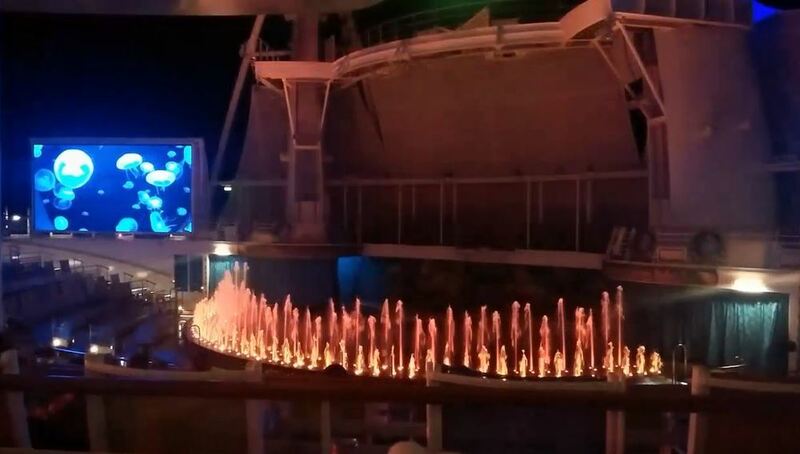 In this article about Allure of the Seas, I have focused on particular details about Allure and our activities on this cruise. Included with this article is a comprehensive video tour: Allure of the Seas Cruise, Eastern Caribbean. There are many sources of general information about Royal Caribbean's Allure of the Seas. One that I think is well presented is at The Avid Cruiser. We very much enjoyed both ships. For our personal taste we somewhat preferred the theme look of Oasis which felt...lighter. For entertainment we preferred Allure where the caliber of show entertainment talent was outstanding, exceeding expectations. We selected the same stateroom on Allure, forward port side on deck 11, that we had on Oasis since we already knew that it was excellent in location, comfort and view. Our stateroom was category D3, Superior Ocean View Stateroom with Balcony. Unlike other (smaller) cruise ships that do not come with a beautiful interior park, you have a choice of inside view (Central Park or Boardwalk) or ocean view. For us, ocean view with balcony is the only consideration. The ocean view balcony adds space, provides a wall size picture window view of the sea, opens to refreshing breeze, and simply offers a nice, quiet getaway. There are a lot of hotels in the Fort Lauderdale area within reasonable distance of Port Everglades cruise port. For this cruise we hoped to extend our cruise experience with our choice of accommodations, not just relegated to a place to stay before the real fun begins. We did not want to take a chance on a bad flight connection spoiling our cruise, so we arrived the day before. And we like Fort Lauderdale so we stayed an extra day after the cruise to enjoy some local site seeing. Each of these hotels will have its own review here. Both were wonderful choices. Our stay at each was very comfortable, the people exceptionally friendly, and we had a great experience touring around on the Fort Lauderdale Water Taxi. Hilton Fort Lauderdale Marina has an incredible view, enhanced by our high corner room that had large picture windows and a wrap-around balcony that overlooked the waterway, beautiful yachts, and night views of two cityscapes. Royal Caribbean's website provides very nice tools for planning your cruise including making reservations for shows, meals, and excursions, and all other details. Information is provided that makes it very clear what documentation is required...pay careful attention to this. Showing up without the government-required documentation will likely ruin your cruise. For this cruise, we did not have to wait for luggage tags to be mailed. We simply printed as many as we needed, followed the folding instructions to end up with very strong, sturdy tags, and stapled them to our luggage at the hotel before loading it onto the transportation van taking us to the cruise port. Royal Caribbean does a masterful job of logistics. Getting onto the ship was smooth and carefree. At the hotel we signed up for the earliest transportation to the cruise port and even then ended up fairly far back in line. But the line moves rapidly and we were moved onto the ship at about 11:30am with hours to explore before our 5pm departure. Our luggage was waiting for us outside our stateroom by 1pm. The most difficult part of the pre-cruise planning was the time spent investigating the excursions that souned interesting, getting information and videos from the Web, and making decisions on which to sign up for. It was very helpful to research the excursions to get feedback from others who took them. This allowed us to set accurate expectations and to know what to take with us. Ship time: be aware that ship time stays the same throughout the cruise, U.S. Eastern Time, at least for Caribbean cruises. This is important to remember when the local time zone differs. You sure don't want to miss the ship's departure. Dress standards: on our last cruise we discovered that we brought more clothes than we really needed. This time we packed a little lighter and it worked out fine. I brought a suit for formal night, but left home the sports coat having discovered that wearing it to dinner at other times was overdressed. Excursion shoes: If you go on excursions that involve hiking or walking through water, be sure to get closed-toe water shoes that are quality constructed. Wear them as much as you can before the cruise, including walking through water and uneven terrain. Make sure they stay comfortable all day and do not rub blisters on your heel or elsewhere on your feet. Cheaply built water shoes fall apart quickly and will leave you wanting or suffering. I'm glad we listened to that advice before either of these cruises. Even on tame excursions, there can be a lot of walking. Plan for comfort. Flip flops don't cut it. Clothes hangers: bring hangers if you need more than 26. Power outlets: be aware that there are no power outlet near the bed. See my video for a view of the power outlets available at the desk. Night light: the stateroom bathroom light becomes a night light when the light is turned off. Copy of key documents: make digital photos or photocopies of your driver's license and passport. Some passengers did not get the memo that one of the IDs may be required in addition to one's SeaPass card in order to return to the ship from a foreign port. I checked and confirmed that a copy of the ID is ok, that you do not have to take your actual driver's license or passport when you leave the ship. But check to make sure this still applies when you sail. Also, verify if the actual driver's license is needed if you go on an excursion that involves driving a vehicle. Wet clothing: our wet clothes did not dry when hung in the bathroom or even when hung or laid out in the main cabin. Crown & Anchor members get a discount on some services but you need to ask. Between boarding ship and access to your stateroom: consider what you will need before you have access to your luggage. We put a few things in a light weight backpack. Excursions: A foot injury prevented us from scheduling high adventure excursions, so our first two excursions were peaceful and relaxing. I followed those with an amazing scuba trip at St. Maarten. The ship is so large that even with a full complement of guests there are always places one can go to find peaceful quiet. One such place is the Viking Crown Lounge high above the ship's stern on deck 17. It has floor to high-ceiling picture windows with a grand view spanning front and sides. This lounge has very comfortable chairs and a quiet atmosphere, sometimes including soft live music—a good place to relax. However, we usually preferred being out in the air where we could feel the breeze, enjoy the smells of the sea, and listen to the ship cutting through the ocean. The balcony in our stateroom offered this experience and we took good advantage of it. Mostly, though, we like being "out and around" with access to people, the frozen yogurt machine, live Caribbean music, and just walking around. So maybe our favorite place to go (at least we referred to it as "I'll meet you at our favorite place") was the deck chairs section not far from the aft portion of the ship on the port side of deck 15. The deck chairs are sleepy comfortable. My Kindle books are on my Android smartphone, so I could always read. Or just look out over the ocean. Or nap. Or people-watch. Or, best of all, hold hands with my wife and soak it all in. Another favorite is the adults-only mostly glass-covered Solarium at the ship's bow. There we chose among several pools, whirlpools (including very large and welcome infinity pools), comfortable deck chairs under cover, Solarium Bistro snacks (day time) and a broad view of the surrounding ocean. Royal Caribbean thoughtfully included windows in the glass that can be opened for unobstructed photos. When relaxing in a whirlpool it sometimes came in handy to have a waterproof case for my phone; then I still had my books with me. My wife discovered a fun place to visit at the stern of the ship just off the jogging track on deck 5. The wooden deck chairs there were not as comfortable but the view was interesting. We enjoyed being there when debarking from St. Thomas where we could watch the huge ropes getting released from their moorings then pulled slowly into the ship by unseen winches. We enjoyed going to the ship's stern on deck 15 to get the TV commercial view of the ship's powerful prop wake. While there we enjoyed watching people catch the waves at the Flowriders. It was especially fun watching the kids taking to it naturally, entertaining the observing crowd. Around the corner was the zip line and rock walls. Our favorite evening stop was the 9-hole miniature golf course on deck 15 (stern). Exceptionally well maintained like all else on the ship, lighting was subdued in the evening for a romantic date atmosphere but sufficiently lit to see to play. We were often the only ones on the course in the evening. We didn't spend much time (or really any time) among the sun worshippers. Those locations were very crowded during prime time and, well, they're in the sun. Nor did we spend time with the party crowds. The ice skating rink would have been a fun pastime if we could ice skate. We enjoyed going down to deck 6 at the stern to visit the Boardwalk and the AquaTheater. There was almost always some activity going on at the AquaTheater, from shows to practice sessions to guest activities (like scuba classes). It boasts the largest, deepest freshwater pool at sea including two diving platforms over 17 meters high, so high that divers have a signal when conditions are safe to dive. The pool floor can be raised or lowered to any needed depth. As a show progresses the pool might be deep for high dives, then shallow for splash dancing, and then completely above water to serve as a stage. Trampolines, built into the floor to the side of the pool, can be rotated into view to be used for Cirque type performances. One of the daytime Aqua shows features the Madagascar characters with cast members jumping, swinging, diving, and falling all over the theater area. We also enjoyed the evening shows, one like a miniature Bellagio Fountains. An outdoor movie played on the big screens at least one evening. Just riding the glass walled elevators through artistic space on this 17 deck ship was a favorite spot (we liked the elevator area art better on Oasis). Royal Caribbean does a terrific job of pampering its guests. Conveniences abound. Need a towel? There is a towel stand with attendants. Want to know what is going on? Strategically placed kiosks help you to make sure you don't miss anything and provide directions. Friendly staff offer help with a smile. The ship is kept spotlessly clean and well maintained. Our stateroom attendant, Everton Barton, took great care of us. He provided a special service that I wish I had thought of on Oasis by bringing a canister of ice to our room twice daily. It melted into cold water which was a welcome evening refreshment. We also enjoyed coming home in the evening to towels folded into various animal shapes. Need a snack....oh the plethora of choices! We must have done a lot of walking to have avoided gaining weight on this cruise. Our personal favorites included Sorrento's pizza on the Royal Promenade, frozen yogurt cones outside on deck 15, a great variety of hot dogs at Boardwalk Dog House (which happily takes the place of the donut stand in that space on Oasis (awful donuts), Park Cafe in beautiful Central Park for a sandwich, salad or cookie, and the Solarium Bistro in the adult section at the ship's bow for healthy eating. Beverage packages must be a significant source of Royal Caribbean income. How do I know this? Every day for weeks prior to the cruise I would get an email encouraging us to sign up for a beverage package. Every day I would look at my wife and say "I think they want us to have a beverage package" and we'd laugh like it was a fine joke. On ship the push continued. We rarely drink soft drinks and never alcohol. But we do enjoy water, milk and juices. While out on the decks during the day, such drinks were easy to come by. In the evenings, not so much since many of the side snack vendors were closed. There were still open restaurants and cafes, so I got milk and juice to take to the stateroom (I put them in the mini-bar fridge to stay cold). On this cruise Royal Caribbean had a new offer for soft drinks. It comes with a large plastic drinking cup which has an RFID or similar device that activates soft drink machines placed around the ship. That was actually a tempting plan until I realized I would be carrying that special cup around everywhere I went. We enjoyed the humor of the cruise director on Oasis, Ricky Matthews. The Allure cruise director, Ken Rush, for our taste was generally...irritating, albeit in a very high energy way, though many others seemed to like him very much. At one point I tried to compliment him on the quality of a particular show, but he was busy greeting the crowd departing an event and gave a brusque response, seeming more "on stage" than actually greeting people. His morning talk show was helpful though one constant aspect became a source of ironic humor to us, albeit just part of his job description, as he pushed services that we would really, really, really enjoy that would only cost a gazillion dollars, a great deal! I did not expect the Vitality Spa to be as nice as it is, or as big. If you use spa services be prepared for some unintended humor when up-sale pitches begin for products that are "vital" to your good health. So, I really need soak in a daily bath of what? For how much? We had intended during this cruise to have dinner at one of the specialty restaurants, but the fine dining and great service at our private table in the Adagio Dining Room was just too good to miss. This time I thought to take photos of the menus to remember and to share here. Rommel Candido, our attentive waiter, like our waiter on Oasis, always made spot-on recommendations for meal choices. The dishes were elevated in preparation and presentation, and they were always delicious. In fact, Rommel frequently wanted us to try the other choices and would bring those dishes or desserts, too, just so we could get the full experience of their amazing chefs. The three-deck Adagio Dining Room is beautifully appointed with seating for 3,000 passengers. We had a table for two reserved for us at 6pm every day, our chosen dinner time (8pm being the other choice, reserved before the cruise). Alternatively passengers can sign up for "My Time Dining" for which a reservation is made daily (one of the three dining room floors is set aside for this), but we prefer having a waiter who knows us. The Adagio also serves breakfast and lunch, no reservations. Guest can choose from a buffet or menu orders. The Windjammer Marketplace is a buffet restaurant with a very large selection of food of various nationalities (including traditional American breakfast cuisine). Come early or be lucky and win a booth seat at the floor to ceiling window. This is especially nice for breakfast on days that the ship is arriving at a port. Some mornings we had breakfast in the Adagio main dining room, but most days we ate at the Windjammer. The big shows like Chicago are presented in the spacious and elegant Amber Theater. Entrance to a show is efficiently managed by scanning passengers' SeaPass cards. It amazes me to see a theater that size out on the ocean. If not for mild and very subtle (usually) ship motion, it has the feel of a Broadway theater. The best seats in the theater are ignored by the incoming crowd. On the main floor, going down the steps to the main level, just to the left are seats tucked into a space just in front of the wall. These seats are especially comfortable and have a full open area for leg room. The location is just to the left of center—a great view of the entire production. When the show is over, egress is convenient and fast. We attended all of the main shows and several of the more private venues, coming away from each one exceedingly impressed. Simon Cowell likes to disparage cruise ship performers, but on this Allure cruise the quality of talent was not inferior to Broadway. We enjoyed the production of Chicago very much...wonderful star performers, but the show that blew us away was Blue Planet. We didn't have any idea what to expect but it was absolutely extraordinary...performances, sets, script—all mesmerizing. One set is for an underwater ocean scene. The use of lighting, translucent floor to ceiling curtain, back lighting and special effects, it presented a convincing below-the-sea environment. We thoroughly enjoyed this show. Here is the Royal Caribbean information page on Blue Planet. Tony Tillman was a headliner on our cruise. He really knows how to give a show. Talented, amazing, hilarious. Loved his show. The ice skating show was fun to see, partly because it was there...on a ship at sea. Ice Games features professional skaters that "brings the classic board game Monopoly to life." It was ok for us, not great. The ice show on Oasis was better but the highlight of that show on Oasis was the pre-show that featured a very skilled sand artist. On our last cruise I pre-purchased a lot more minutes than I needed. I did very little browsing and I used Outlook for my email. So I would connect to the Internet, download new email, disconnect, read/reply to my email, connect, send, disconnect. So this time I purchased a small package of minutes and it worked out fine. Just make sure you remember to disconnect. Some times were difficult to connect and performance was low. This seemed to correspond to prime time activity for ship guests such as early morning and early evening. We were very pleased with a smoking policy change that Royal Caribbean made as of January 1, 2014. All staterooms are smoke-free, including balconies. On our last cruise there were infrequent times when smoke from a nearby balcony would drift onto our balcony, chasing us back inside. No such problem this time. Thank you RC. Our seven day eastern Caribbean cruise featured stops at the Bahamas, St. Thomas, and St. Maarten. Each stop added a wonderful experience to our lives. For our excursions we had originally intended to go on one that involved sailing on a catamaran and blue water snorkeling. But a pre-cruise foot injury nixed an activity using fins. Still, this was our first visit to these particular islands, so I was mainly interested in getting to know them to the degree that one can in the few hours allotted to a landfall while being guided within a protective bubble. On the other hand, I was not there alone. Being in a new country with a loved one, I appreciated the security that comes with the due diligence done by Royal Caribbean and the assurance of getting back to the ship in time. Of course, for this trip, that meant not seeing much of the real local scene and culture. The temptation was strong to visit Atlantis. But after watching several videos it seemed like we had already seen what there was to see at Atlantis. We're beach people, so we elected to check out Blue Lagoon Island. The excursion began with a water taxi ride, taking about 30 minutes with tour guide commentary as we passed Atlantis and homes of the rich and famous. Sometimes I wonder if the tour guide "says things with authority" without really knowing. One island was identified as being used for Gilligan's Island. I Googled it and could find no evidence of that. But who cares anyway? Just boating through myriad small, pretty islands was its own reward. I admit beginning to hope that the next island was our destination, which took a few islands to become true. But the entrance into Blue Lagoon Island was nice. For me it's simple. I love beaches and the beautiful colors of Caribbean water. Blue Lagoon Island is a quintessential island tourist stop. As I saw the relatively small cages (ok, buildings with small marked off covered pool areas for sea animal encounters) with people lined up in a tight regimented row as a dolphin splashed from one person the next, repeating the same mini-performance for every person...I was so glad we didn't sign up for that one. Give me an open water dive with "real" close encounters with the fascinating life in the sea. Instead we signed up for a simple self-guided visit to the island/lagoon. The lagoon is pretty. When our children were young, they would have enjoyed playing on the floating inflated playground equipment. That did not appeal to us. I rented snorkeling equipment and swam out into the lagoon. It was completely sterile. Nothing to see. Not even fish. So I walked to the other side of the island (a very short walk) to snorkel in a bay there. Unfortunately it was low tide which made it very difficult to navigate across the rocks (walking backward with fins) as the waves pushed by with intent to knock me on my tush. It was a long "walk" with several spills to get far enough out for the water to be deep enough to swim. Then I was able to snorkel around the small coral formations. Snorkeling close to land like this does not offer much visibility or interesting sea life, at least here, but it was nice being "out there." Lunch was a hamburger with trimmings, cold fries and one glass of flavored water. Don't have high expectations. On returning to the lagoon I found that my wife had staked out a shady spot with lounge chairs near the beach under some palms. So we relaxed in the shade for a while and did some exploration of the small lagoon area. The return trip to the ship took a little less time, no touring. It was a nice day. Any day without incident in the Caribbean is a nice day. Still, I don't think I would choose this excursion again. I was surprised to learn that our cruise to this point had been mostly in the Atlantic Ocean rather than the Caribbean Sea. St. Thomas is on the border of the ocean and sea. Our excursion began with an open-side bus drive to Mountain Top with Percy as our excellent excursion driver and guide. St. Thomas is the only U.S. possession where cars are driven on the left or, as Percy put it, the right side is the sui-side. The road up the mountain was narrow and passed through rainforest, so passengers sitting on the side nearest the road's edge had to worry about getting whacked by a branch. Passengers on the other side enjoyed the view of buses passing from the other direction just inches away. It all added to the adventure. We enjoyed the open air ride. Along the way there were periodic openings in the trees with pretty views across the island, including some with our ship in the distance. From Percy we learned that there is no source of fresh water on the island other than rain. So every house has a cistern that is fed from water captured by gutters on the roof. If one runs out of water during the dry season it's an expensive proposition to have water delivered. Virtually everything used by humans on St. Thomas is imported. Tourist trade is key. Mountain Top claims an elevation of 2100 feet but it is actually 1479 feet. It's not like that is a grand height, so why exaggerate? At that it is 7 feet below the highest island peak of Signal Hill. But it does have a beautiful lookout point with a grand view of Magens Bay and surrounding islands, St. John, Tortola, the Tobagos and other British Virgin islands. There is a very large souvenir shop on Mountain Top where those so inclined can order their claim-to-fame Banana Daiquiris. Buyer beware: one of the t-shirts I purchased turned out to be a size larger than labeled and the print was gone after two washings. After our brief stop here our next stop was Magens Bay. The bay has a long, beautiful sand beach, clear Caribbean waters beckoning to visitors to come hither, and is surrounded by rainforest. It really is a beautiful setting, but the owner's claim of it being the most beautiful beach in the world could be challenged by many other beaches. We arrived too late to snag a shady spot in a preferred location, so we ended up spreading our towels under palms that were a bit too close to the rest room septic tanks. Lunch was not included in this excursion. There is a beachside cafe. After a couple of hours at Magens Bay we headed into the shopping district of Charlotte Amalie where we were dropped off to wander around the shops at Vendors Plaza for a couple of hours. This turned out to be surprisingly fun. We avoided the main drags in favor of the shops in the alleys. There we discovered many unique shops and boutiques (intermingled among an amazing number of jewelry shops) along with intriguing historical architecture and lovely flowered settings. In centuries past these buildings served as warehouses for trade ships. Ice cream stop: One place we almost walked past, and I am so glad we didn't, is the Virgin Islands Ice Cream Company. At this small shop we met Vivienne, the owner, and her helpers, a young boy, Jahan, who looked to be 9 or 10 years old, and girl, Jahmika. Jahan is a budding entrepreneur. As we came to the counter he boldly asked us what he could get for us. We had not yet decided to order ice cream, but his wonderful attitude and pitch captured us. He assured us that he was a great ice cream scooper. After we received our ordered ice cream cones (which were very good and welcome on that warm day), he turned to Jahmika and said, "See, I told you I was great at this." At St. Maarten I went on a scuba excursion with the Scuba Fun Dive Center. I loved this excursion. Transportation to/from the ship was in very comfortable, modern buses. The dive center provided good quality rental gear, the dive crew was humorously entertaining, and the dives themselves were fantastic. I am very susceptible to sea sickness, so I used almost every remedy in the book including ginger pills, behind the ear anti-nausea drops, ginger gum, meclizine the night before, and mainly watching the horizon on the boat ride. Of all of that, something really worked, because I had nary a twinge of sea sickness. Our boat ride was relatively short, only a couple of miles off shore with Allure still plainly in site. Our first dive was at the Teigland wreck, a 120 ft freighter, the that sank in 1993, at Cable Reef, max depth 68 feet. Our second dive was The Maze, max depth 55 feet. The coral reef here has tunnels, caves, tall ridges, labyrinthing passages, and a wide variety of sea animal and plant life. Our dive master rattled metal rings which attracted the local nurse shark. Now I understand why St. Maarten is recognized as one of the best diving locations on the planet. This was a great excursion. Royal Caribbean did a great job of choosing an excellent dive center. Highly recommended. My regular dive camera malfunctioned so I had to try plan B on my second dive. I was a little nervous about taking down my LG G2 smartphone since it would be a big problem if my smartphone were damaged. But my smartphone had no issues on a 60 foot dive. I put it in an Evecase which is rated waterproof to 100 feet. And it works fine. Audio came through well, video worked. The problem they don't tell you about is that the water pressure causes the touch screen to be non-responsive. So I am glad that I started the video at the beginning of my dive. Still, I was not able to take photos or zoom or do anything but just let the video run. And toward the end of the dive, another diver swam below me and when my camera passed through his bubbles, it turned off the video. I couldn't get it to go again. We have now cruised on both Oasis of the Seas and Allure of the Seas on both western and eastern Caribbean itineraries. Both ships and both itineraries were great experiences. We would be pleased to flip a coin and take another cruise on either ship to either itinerary. These cruises are excellent values for a wonderful and relaxing vacation. We have only cruised with Royal Caribbean, but how does one improve on perfection? A special mention for Hilton Fort Lauderdale Marina: if you get a chance to stay here, ask for a high corner room facing the waterway. Our room had two walls of windows and a wrap around balcony with an absolutely gorgeous view. On our next cruise I plan to stay at least another day so we can enjoy more of what is offered in Fort Lauderdale. There were many places I wished we could have visited but if, like us on this vacation, you only have limited time in Fort Lauderdale, be sure to take a tour on the Fort Lauderdale Water Taxi. You can get on and off at stops all along the waterway. During the tour the taxi staff points out landmarks and interesting information about the sites as they are passed, including homes and yachts of the rich and famous. This tour was great fun, relaxing, and interesting. At one stop we walked out onto a very large beach and tried to catch Allure as she departed on her next cruise. Alas, no joy on that part, but we did enjoy our walk along the beach. I would like to include some photos from our explorations via the water taxi, but I lost a number of photos in a pre-backup disk crash. Sigh. I guess I'll just have to suffer and go again.